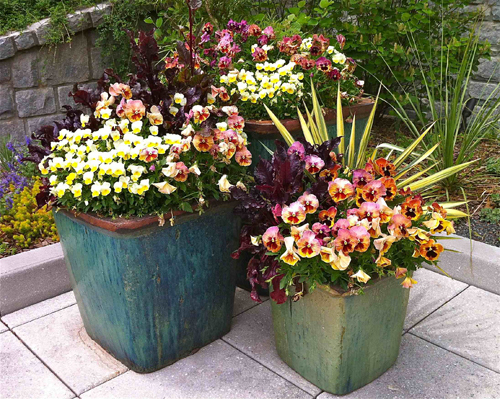 Here are a few ideas for creating vibrant potted plants with lots of greens and burnished hues, for Fall. If you take the boldest colors from fall, like red, orange, yellow, burgundy and add a little touch of bright green you get a stunning display of color. This is the time of year to hit up your local garden center or nursery for some cool weather plant materials. Then shop Arizona Pottery for a stunning planter that will compliment these fantastic colors and you will create a super display that you will want to duplicate year after year. The photo here show two coleus - Dappled Apple and plum colored Velvet lime. They are joined by a cascade of Angelina sedum. Stunning! 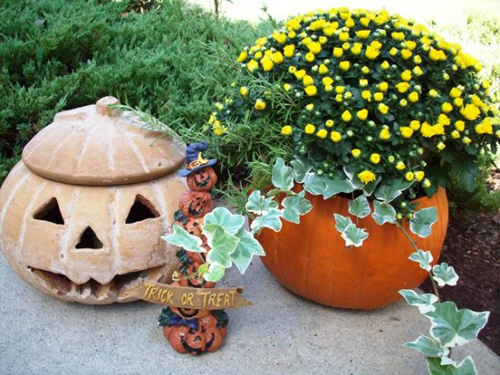 Photo at left shows Lime green Japanese forest grass and a simple pumpkin is added for character. Simple yet lovely! 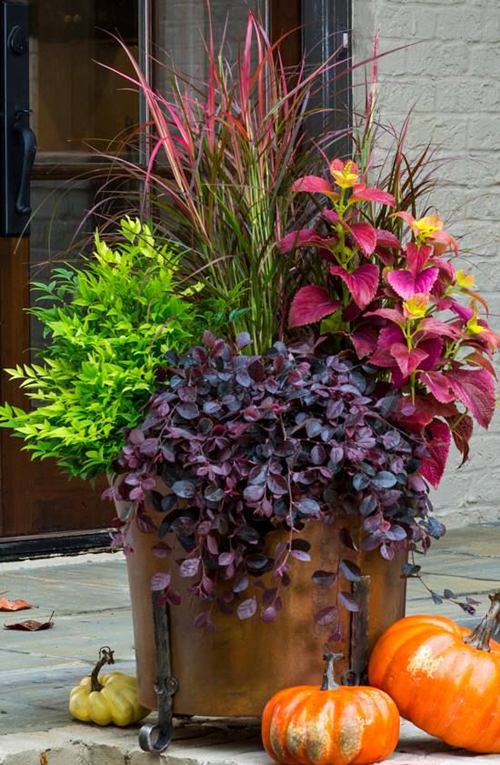 Copper leaf plants and trailing ivies add a rich touch to all containers! 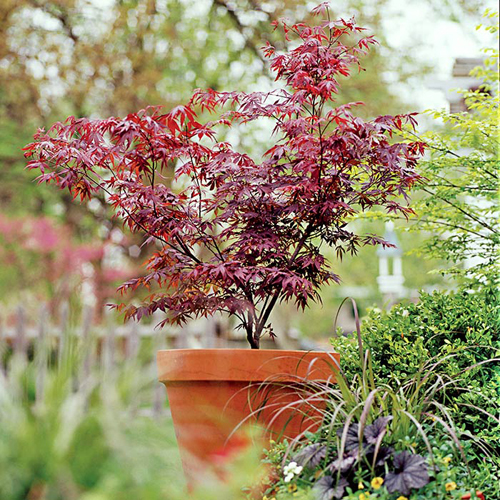 Use Japanese maples which have lush red leaves. What Is Your Fav Houseplant? 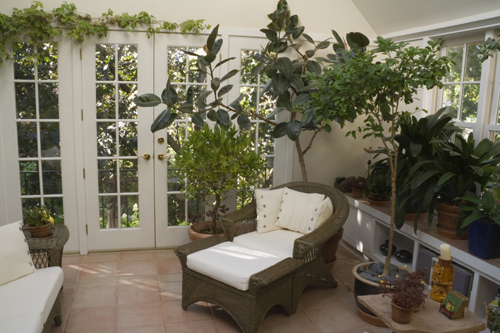 Here are a few comments about houseplants that we want to share. 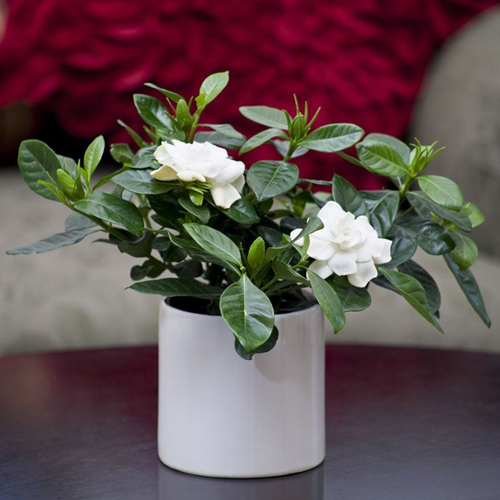 Gardenias make a lovely green bush for most of the year, brightening up a sunny front room. As the weather cools they bloom and transform the room into a beautiful, fragrant, tropical garden. Plant them in a decorative container and make a bold statement in your home. 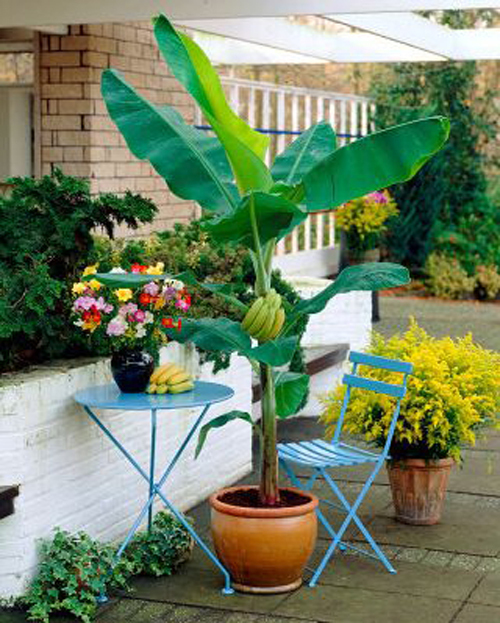 Banana Trees can be potted and placed in a sun room or garden room indoors. Their leaves are constantly emerging and uncurling. In the evening, the leaves fold down making a bouquet of little green pyramids. 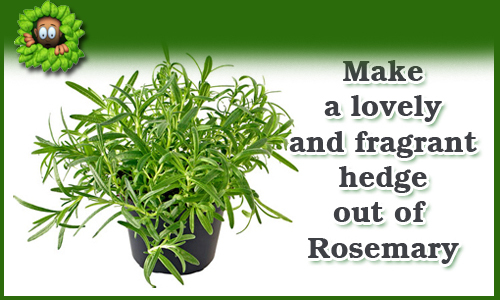 Try to plant them in a container that is noticeably larger than the root ball. 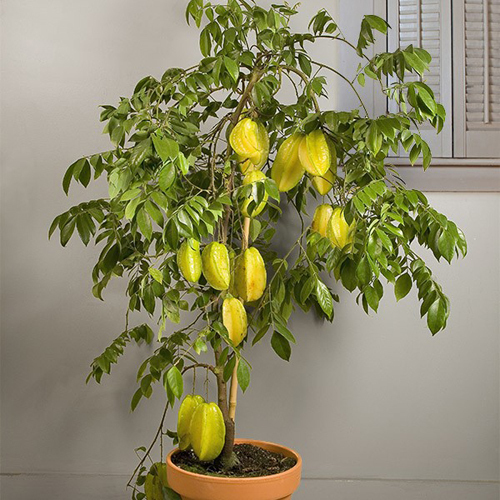 Since they like the added space they will grow healthy and lovely leaves and flowers. Phalaenopsis orchids are easy to grow. If you water them one or twice a week and lightly fertilize them once in a while, they reward you with beautiful flowers for several months. The best part is that they bloom in January and February when gardeners really appreciate their color. Their plant needs are unusual. Clivia is easy to take care of and they brighten the room with clusters of orange flowers. Even when they are not flowering, the foliage is handsome. African Violets are lovely. They welcome you home at the end of a long day with a burst of color. The leaves are stunning and a great compliment to the bright and bold colors of the flowers. Some leaves are variegated green and white giving them a unusual appearance. 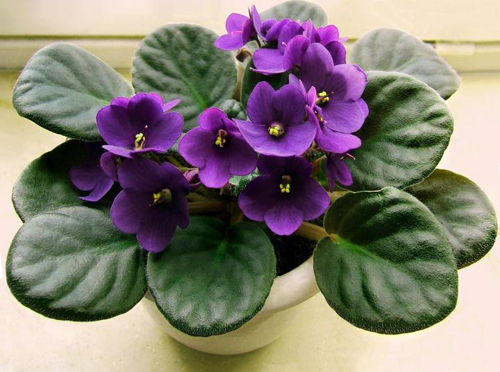 There are specific pots made for violets that hold a inner pot over a outer pot that contains the water. 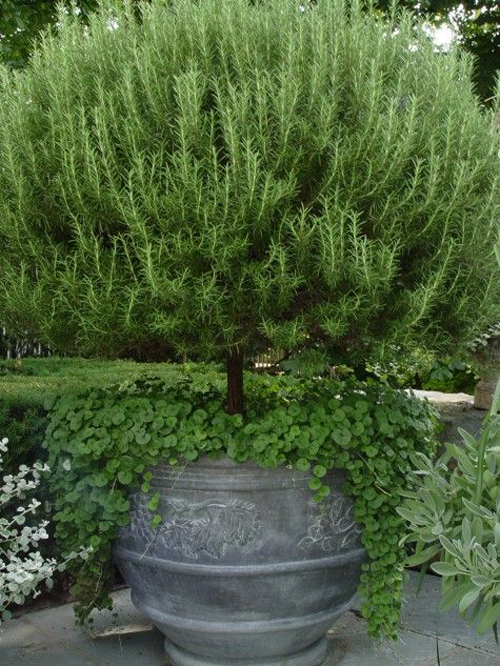 We show it in a lovely clay pot that is functional and simple. All of these are unusual plants that make great houseplants! Read more.....5 tips for overwintering container. Read more.....Live Christmas Trees make special memories. Read more.....How to help wildlife survive winter. It's that time of year when the "jewels" of color are starting to show up. You don't need a lot of space to get big color. By planting one of the trees listed below you are well on your way to achieving stunning color. Amber, scarlet and plums will all show up and be hard to overlook. Many of these types of trees fit perfectly into small gardens and are wonderful planted into large garden planters. If you plant them now, these trees will develop a strong root system in the cool months and thrive when the weather warms. 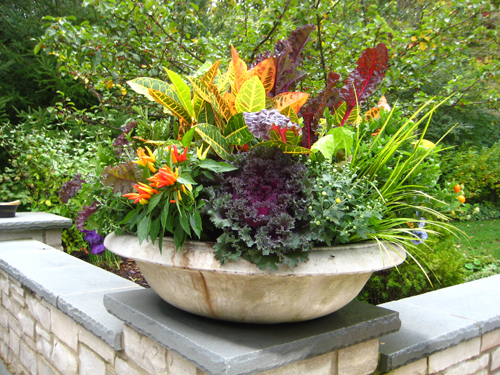 When it comes to selecting the type of planters to use we have a few tips to share. Even though "Terracotta Clay" is lovely and makes a wonderful compliment to the bright colors of the trees, these are not our first recommendation. Terracotta is meant to breathe and there for will break down over time. This means if you plant a tree into a terracotta clay pot you will eventually have to re-pot it. Since it can only get bigger this could become a problem. Ceramic pots or planters that are high fired would be a much better choice. These planters will never break down unless they are cracked or chipped. Then the water you use on the plants or trees will find that crack and get inside the clay and eventually erode it. You will also have a larger selection of colors, finishes and styles to choose from. So, check out these tree suggestions below and let us know how they work for you. 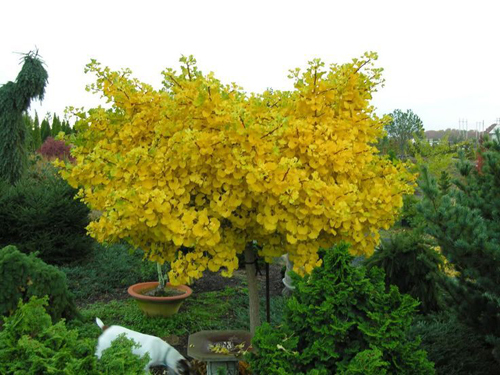 Ginko: Unusual fan shaped leaves become glowing yellow in fall and linger a long time. When leaves finally drop, they do so almost all at once, creating a golden carpet atop lawns or paving. These trees can reach quite tall but if planted in a garden pot it will stunt the growth of the tree and keep it on the smaller side. Place the tree in full sun and enjoy these lovely leaves. Japanese Maple: Prized for their graceful shape, delicate leaves, and diminutive stature, these slow growing maples can reach 20 feet, but most of the popular varieties are less that half that size - perfect for containers in entryways and patios. They also are great for backdrops for ferns and azaleas, or under stores for oaks. All provide vibrant fall color, red leaved varieties that intensify, turning from red to scarlet. Favorites for pots include lacy dissectum and burgundy red dragon. Plant in a pot with drain holes. Use a planter that is atleast 2 inches larger than the root ball of the tree. Use a well draining potting mix and water deeply after planting. Repot the tree every other year if necessary and feed with fertilizer according to package instructions. Many gardeners know that heartbreaking feeling that comes when the cooler weather approaches. They feel the must say good-bye to the lush potted plants that they nurtured all spring and summer. But, we want you to know that you can move many of them, still in their pots, indoors with good success. 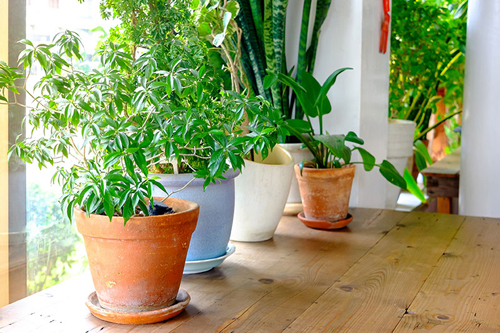 Turning a annual potted plant into a houseplant is not that difficult if you follow a few easy steps. 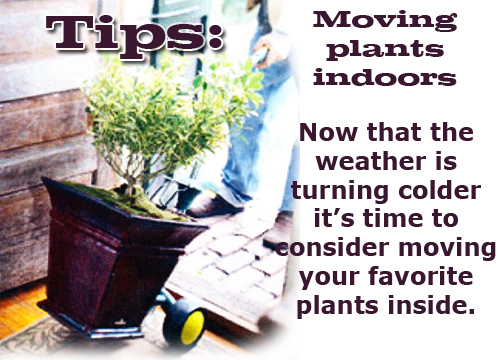 The first thing to consider when your are ready to make the move, is where you are moving the potted plant to. Typically most plants need as much sunlight as possible since the season has more dark than light hours. Find a window where they will get the most sunlight. 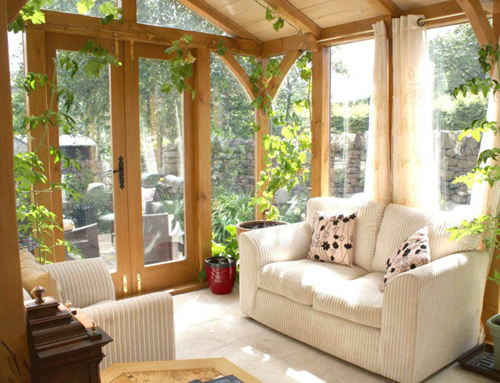 If you have a enclosed patio or sun room they are ideal. Make sure they aren't located on a heat vent. Since indoor air tends to be drying, it's best to find a location farthest from the heat source. You will also need to water the soil more than it when it was located outdoors. If it is possible, turn down the thermostat a degree or two to help keep the air cooler. You don't want to burn up a lush plant because of lack of moisture in the potted soil. 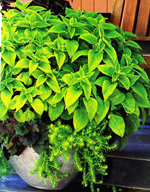 Check the soil in the planter and undersides of the leaves for pests. The last thing you want to do is move in a family of bugs. If you are really worried about this issue you can set the pots up in the garage and then spray them for pest. It never hurts to error on the side of caution! If the plant you want to try to save, by moving it indoors, is planted in the soil you will need to purchase a planter to re-pot it in before you dig it up. We have many sizes and styles available that will all work great indoors. Just make sure you have a sealed saucer so that you won't damage the surface you place the pot on. Remember to use potting soil not garden soil. Garden soil doesn't have the right mix of mulch etc to keep a potted plant healthy. Once indoors, water them completely and keep them moist. Don't let them dry out. Since their growth season is over they will not require as much water but you don't want the soil to dry out either. 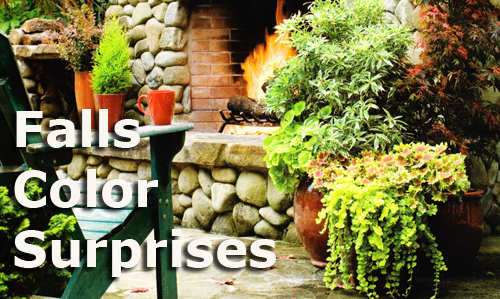 Think of this time indoors as a rest period and don't fertilize. Warm up: Before jumping right in you should walk around the yard for a few minutes. Try collecting all your tools at this time and getting everything organized so once you start you don't have to keep stopping and searching for items. Move any heavy pottery into position before you start. 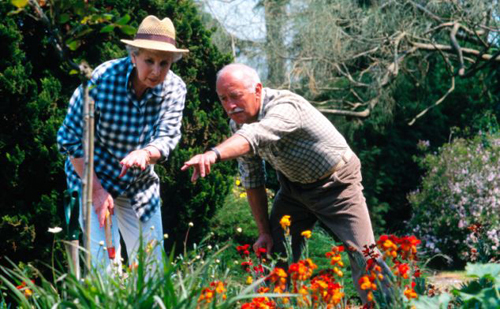 Bend Correctly: Bending over from the waist with your knees locked is the most common mistake gardener's make. Either bend forward from your hips or bend your knees and squat down. This transfers the weight you are trying to life to your thighs and buttocks. We sell a device called "Pot Lifter" that is awesome for lifting large objects not just garden pottery. Click here to find out more information. Avoid twists and turns: Avoid being repetitive with movements. If you are performing the same movements over and over, like shoveling dirt, stop time to time and take a break. When filling a large planter with soil, try doing it in a couple of steps. Fill the pot half full, move on to something else and come back and finishing filling the planter. Wear comfortable, cushioned shoes: There are gardening shoes that have nice thick soles that help to minimize the impact on your feet. They also help with alignment so you don't trip or stumble while walking on uneven surfaces. Cool down after gardening: When your chores are complete, this is the time to sit down and enjoy your hard work. 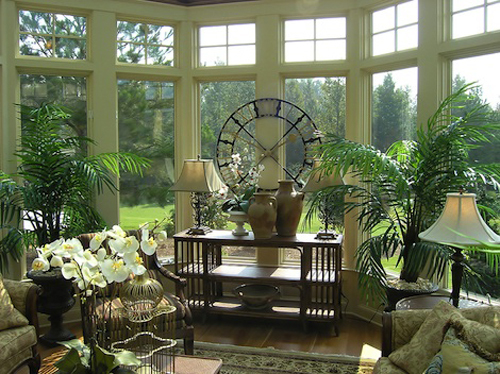 Look at your stunning potted planters and savor the view. Relax, stretch your muscles while they cool and enjoy a final glance at all that you have accomplished. If you have access to a hot tub this is the ultimate reward for a day of hard work. Drawing 1 shows the incorrect to bending. Don't lock knees. Drawing 2 shows the best way to bend when lifting. Drawing 3 show a great way to relax your back after gardening all day. 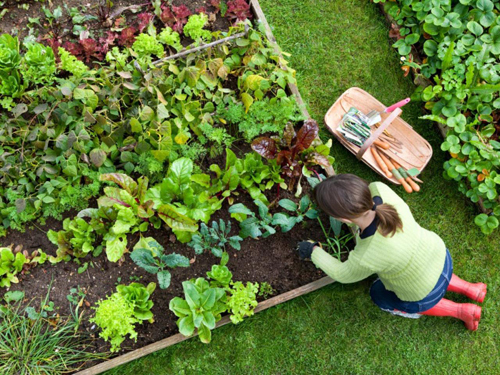 If you follow even a few of these moves, we think you will find your gardening experience much more enjoyable. It's the little things that make a big difference. Read more.....Who is the greenman? 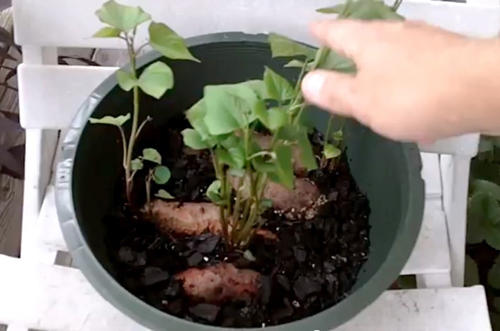 Growing plants out of food pits, that are potted in a simple container, are easy and fun to do. You won't have to even purchase any items if you choose, therefore making this a very inexpensive and easy project. 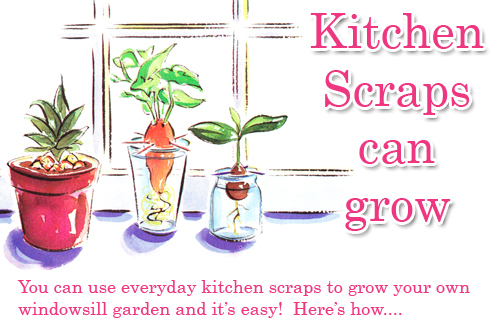 Because of the simplicity of growing these kitchen scraps in pots, it makes a child friendly and creative project. Most fruits and vegetables have some part that can be potted and grown. Just save the pit from a avocado, the top of a pineapple and a whole uncooked sweet potato and you are ready to get started. These are the most common and well known kitchen foods but don't forget to dig a bit deeper. Try popcorn kernels, garlic cloves, squash seeds like pumpkin or acorn, melon seeds, beans, lentils and even lemon & orange seeds. All can be potted and grown with ease. Don't be concerned if your first attempt isn't successful. It could be the condition of the pit or seeds and not your handling of them. Since they are easy and inexpensive to work with just keep it up and you will achieve great success. AVOCADO PIT: The next trip to the store, purchase a avocado and keep the pit. Dry it out for a few days and poke 3 or 4 toothpicks around the middle. This helps to support the base of the pit above the water level while trying to grow roots. If the pit is tough or very hard, poke the holes first with a small nail, then place the toothpicks. Take a glass jar or water glass and fill with fresh water. Suspend the pit over the water making sure that the bottom of the seed is covered with water. Make sure to keep the water level filled and the pit covered. After a few weeks you should see white roots sprouting from the base. The the top of the pit should split and a green stem will sprout. Wait till that stem is approx. 6 to 8" tall and then plant the pit in a container filled potting soil. Do not use garden soil. 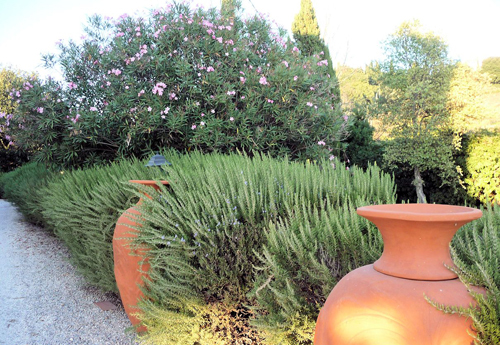 You can choose one as decorative as you desire or a simple clay pot works fine. Set the pot in a sunny spot, keep the soil moist and you will soon have a plant starting. Growing a sweet potato vine is easy but you must make sure that the uncooked potato is fresh and doesn't look like it's been stored for months. 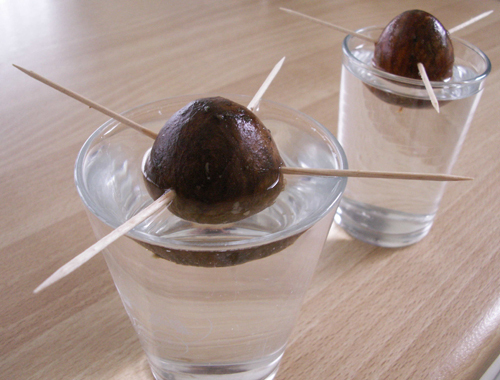 Stick the toothpicks around the body of the potato and suspend in water just like the avocado above. Try to make sure that a at least half of the potato is below the water level. Watch for similar white roots to sprout on the bottom and a green stem out the top. Once this happens, place the potato in a suitable container of your choices, in potting soil and keep soil moist. These are slow growing so be patient! Lastly, the pineapple plant. 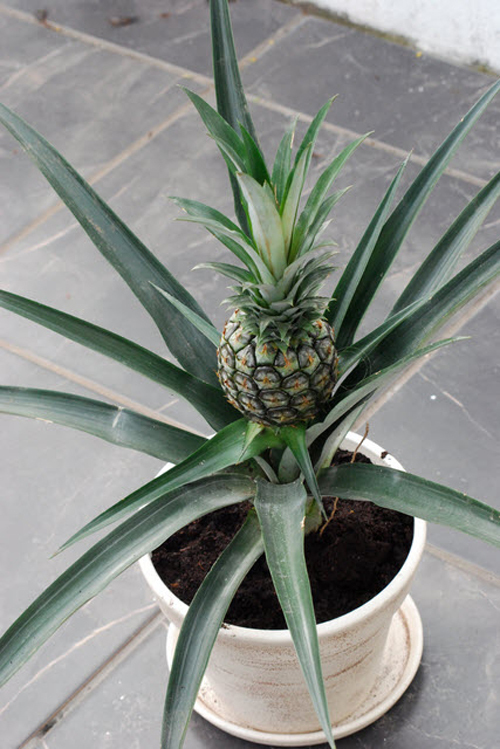 If you save the spiky green top from a fresh pineapple, and plant it in a clay pot filled with potting soil, you should grow a lovely plant. A few tips: cut the top off about 1" below the leaves. Let it dry for a couple of days with the cut end up. Stick the top in the soil like the photo at top. Place the pot in a sunny window and the soil moist. Give it a few weeks and then look for new roots and green leaves coming from the top. This one is really slow to grow and takes approx a year so be patient. It eventually may grow a flower or even a tiny pineapple. 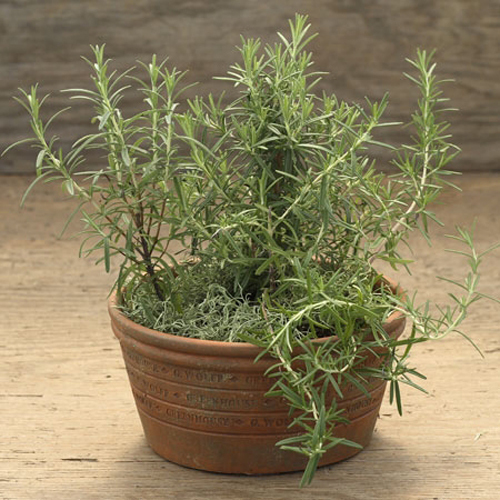 Read more.....Growing herbs - here are some suggestions. We thought this would be a great time to share a few projects that you can easily create with pumpkins, squash and garden pottery. Have fun! 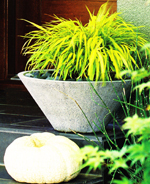 There is no need to greet guests with sad, empty exterior planters just because the weather's turned. Once flowers die off, create a lush, welcoming display with cold-hardy foliage and decorative gourds. Start by planting a backdrop of evergreen dwarf spruces as well as kale, which should survive the first frost. Then pile on gourds and squash like the ones shown in the photo. Keep in mind that edible varieties will last only a few weeks. Sprigs of eucalyptus and fir supply the finishing touches. Another alternative to a inexpensive and creative container can be squash or gourds. 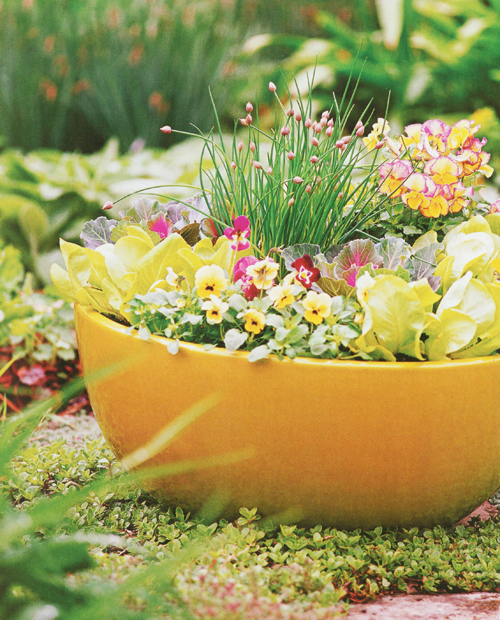 A buttercup squash can serve as a stunning cachepot for succulents. Fill it with crassula and echeveria to re-create this arrangement as shown. Just trim the squash's stem, then position a small pot of succulents on top and trace around it with a marker. Cut along your mark and scoop out all the pulp, then insert the pot. Easy! 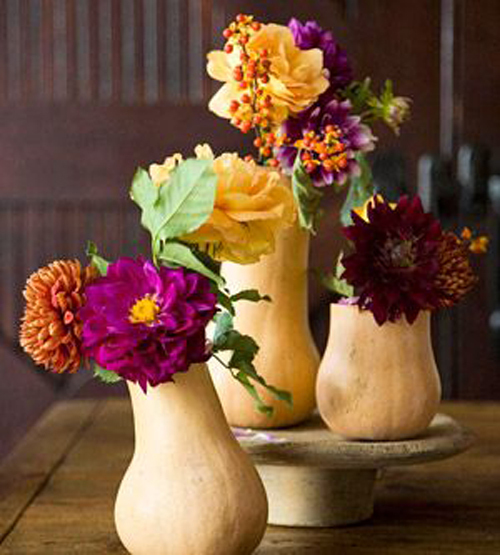 Gourds come in all sizes and shapes and colors and easily become seasonal vases. Cut a hole big enough to accommodate a couple of florist tubes. Insert flower stems for a unique bud vase and use to decorate inside or outside your home. Lovely! This last project is neat because it uses a pumpkin as a planter and it makes a lovely display that can be used indoors or out. Cut out two top quarters of a pumpkin, leaving the stem and a narrow strip as the basket handle. Zigzag the bottom edges, and hollow out the base. Place a block of west floral foam inside. Position two glass votive holders in the foam and surround with a bevy of fall blooms and leaves. Place on a table in the dining room or living rooms. 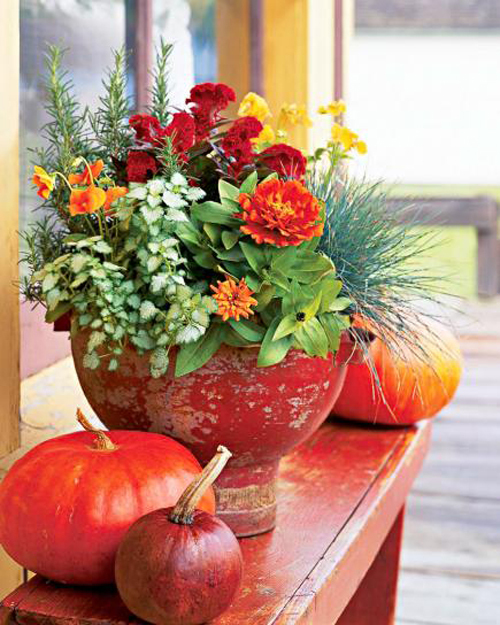 This makes a festive fall display of color that is inexpensive and easy to do. Have fun! Read more......This pottery collector is outstanding! Now that October has finally arrived, it's time to get out in the yard and do some garden and planter clean up. Below is a list of suggestions on things you should be doing approximately this time of year to get prepared for the fall and winter months ahead. If you plan ahead and follow these suggestions, you will have much success in your garden pottery in the months ahead. For blooms from winter through spring, plant cool season annuals now so they get established and start flowering before the weather turns cold. Otherwise, they may not flower until spring. Buy young plants of calendula, pansies, primrose, and snapdragons now and plant them or sow the seeds. Select cleaned out garden pottery and make sure the soil is new. Add fertilizer now to the soil to assure a good start in the the Spring. Make sure there are no cobwebs or insects attached to the outside of the pottery. You want to start with as clean a pot as possible. 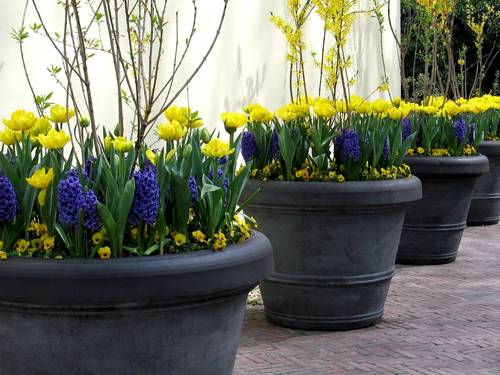 For blooms in spring, fill a big planter pot with one type of bulb, whether daffodil, hyacinth, or tulip. 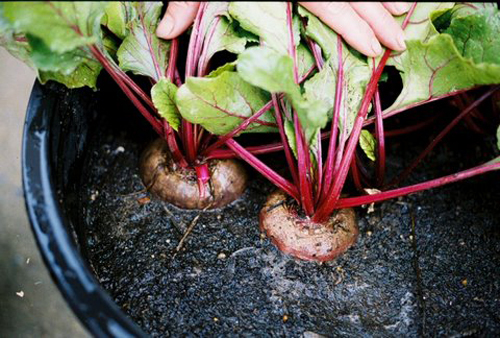 Fill the pot with potting soil so bulb tops will sit about 4 to 5 inches below the pot rim. Firm the soil, then set the bulbs closely together on top; a 16 inch flared pot will hold 40 to 50 tulips, daffodils, or hyacinths. Cover the bulbs with soil, leaving about 2 inches at the top for watering space. 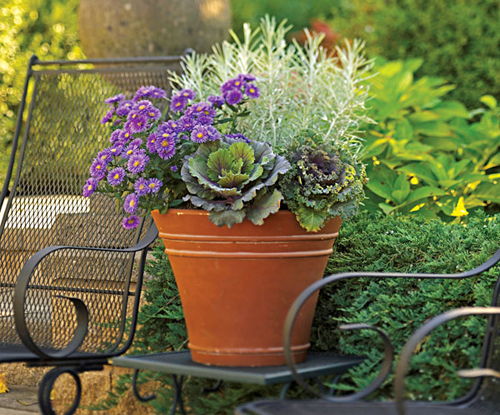 Set the pot in a cool, shaded area, moisten the soil, and top it with mulch; water again. Move pots into full sun when leaves develop. Flowers will appear about four months after planting. If you don't have space for multiple fruit trees, try growing a single tree with multiple fruiting branches grafted onto one root stock. For best selection, order bare root trees now for January pickup. Place these planter pots in a shaded area and mulch the top of the soil for added protection thru the cold months ahead. October is the best month for setting out any kind of plant that's not frost tender. Ground coveres, shrubs, trees, and vines all benefit from fall planting, when temperatures are cooling and rain is on the way. Now is the time to clean up debris. 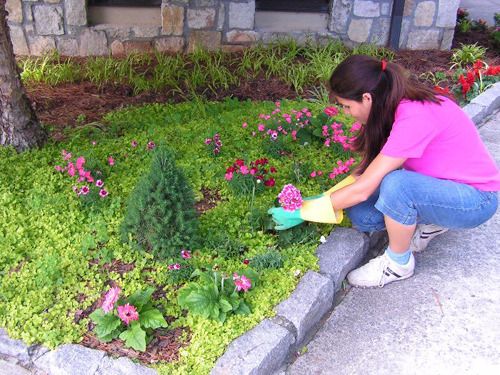 To reduce the number of sites that harbor insects and diseases over winter, pull and discard weeds, spent annuals, and vegetables. Also clean up all fruit and fallen leaves. Compost only plant debris that is free of disease, insect pests, and weeds. 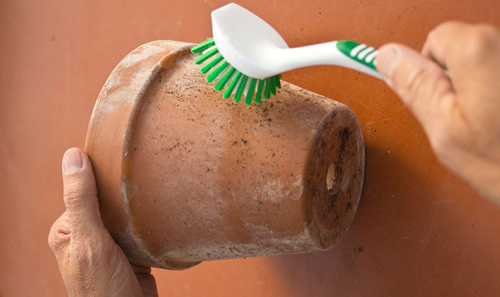 Clean the outsides of all pottery to remove any insects or clotted dirt. Clean off the top soil of dead leaves and flowers and re-till the surface soil to keep it from clumping. Dead head any flowers that are spent or pinch off yellow or dying leaves. Taking a few minutes to clean things up, planning ahead and purchasing a few products now will add assure much success next spring and summer.